Get The Best Six Pack With Bruce Lee Ab Workouts! Bruce Lee was undoubtedly one of the most famous actors to ever live. While his movies were great, he developed perpetual fame due to his incredibly chiseled and well-toned body. He is often called ‘the most toned actor of all time’, a statement which is generally hard to argue against. So, how did Bruce Lee develop and maintain the body that he is famous for? Basically, he understood the underlying sacrifices necessary to develop the famed ‘Bruce Lee abs’, he knew his body back to front, and he committed himself to the development and maintenance of the image that he has become so famous for. Why use a Bruce Lee ab workout? How did Bruce Lee train? What did Bruce Lee's diet consist of? How fast could Bruce Lee throw a punch? While the Bruce Lee workout routine is somewhat speculation and guesswork, we can make many assumptions about the kind of exercises that he must have done. He obviously took care of himself and his body in an exceptional manner, and he did whatever he needed to in order to maintain his image. While it may be difficult to develop abs like Bruce Lee’s or to get as ripped as he was, you can get pretty close. To do so, you need to commit to a workout, eat well, and make sure that you live a good, healthy life. The first step towards training like Bruce Lee is, without a doubt, to complete Bruce Lee exercises. What are these? Basically, they are the type of exercises that Bruce Lee would have completed and which allowed him to develop his near perfect body. Bruce Lee, like any good fighter, knew how important strong core muscles are. He placed a particular emphasis on their training and development, which is one of the main reasons why he was such a good fighter. The Bruce Lee Dragon Flag is one such core muscle exercise which is linked to him. He not only developed it and its movements, but he used it personally to make sure that his abs remained perfect. Speed is the second most important fitness component when it comes to fighting and martial arts. It is therefore logical that Bruce Lee also trained his speed. In fact, he focused on this almost as much as he did on the maintenance and development of his core muscles. The ability to throw a punch quicker than an opponent or to move out of the way of an opponent’s punch is vital when it comes to martial arts. You can’t go past the Bruce Lee workout if you are looking for a six pack ab workout. As the king of abs, Bruce Lee is the perfect example of how hard work and dedication can go a long way towards reaching your goals. Bruce Lee ab workouts incorporate a range of bodyweight exercises. He rarely used weights or equipment when exercising, which allowed him to maintain his body condition no matter where he was. If you aren’t sure what any of these exercises are, then a simple google or YouTube search should turn up thousands of videos outlining them and the basics of completing them well. These exercises should never be done alone. Each workout should incorporate at least 3-4 sets of 3-4 different exercises. When you are confident and have developed a high level of core strength, you can begin to move on to some of Bruce Lee’s more advanced moves, such as the Dragon Flag or frog kicks. These will allow you to chisel your abs to perfection. Eat healthy no matter what. Eat large amounts of protein immediately after a workout to assist in muscle repair, and avoid fatty and highly processed foods. Stay away from alcohol as much as possible. Doing so will help prevent fat developing on your midsection, covering your abs. Allow plenty of time between workouts to make sure that your muscles have time to rebuild and repair themselves. Bruce Lee was a star when it came to working out correctly. Making simple changes to your lifestyle will help you develop a body to rival that of the great man. Bruce Lee is famous for developing his own exercises and workout routines. One of his most famous exercises is his Dragon Flag abs exercises. This involves lying flat on your back, and using your stomach muscles to lift your entire body (except for the upper section) into a vertical position. 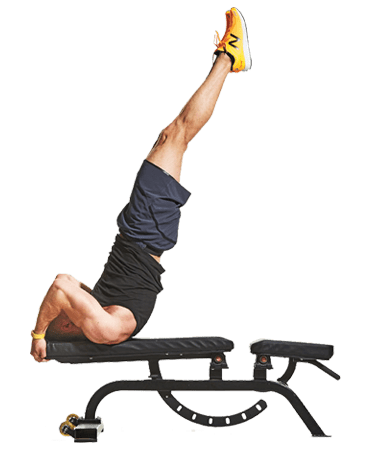 Also known as the dragonfly exercise, this is extremely difficult and isn’t recommended for anyone other than the most experienced ab workout specialists. You need to already have a lot of strength to complete this exercise. Bruce Lee trained hard and he committed himself to his workouts. He did whatever he had to so that he achieved his goals, and he never did anything which could have negatively impacted on his training. While we haven’t looked at it much here, the Bruce Lee chest workout is also great, and is one of the best ways to develop your chest muscles. Bruce Lee ate extremely well. He understood the fact that your body and the amount of muscle you have is very linked to your diet, and he therefore closely monitored what he ate. Ok, a fun one to finish on. So, how fast could Bruce Lee throw a punch? Well, we don’t exactly know, but we do know that when he was filmed they have to shoot at a higher quality than normal and they had to slow the raw footage down just so people could see his moves!